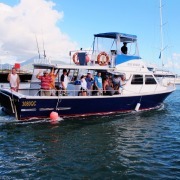 Cairns Fishing Charters provides comfortable, safe, fishing charter trips aboard Blue Whaler, a 42 foot Randell, and Aqua Cat, a 48 foot Randell that are specifically built for fishing. Blue Whaler is surveyed to carry up to 24 Passengers, however, for passenger comfort it is capped to 13 passengers. Aqua Cat is surveyed to carry up to 34 passengers, and for comfort is capped to 15 passengers. 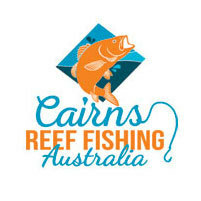 A full range of quality fishing gear is provided, including new Fin Nor, Shimano and Penn reels as well as handlines. Rigs and handmade they constantly update fishing methods and equipment. 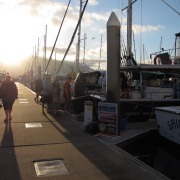 Vessels are equipped with the latest electronics, and huge undercover deck area, seating for all and full size toilet facilities. Refrigerated iceboxes keep your catch in condition, and large eskys are provided for your refreshments. Blue Whaler and Aqua Cat are the only charter fishing boats that are permitted to operate out of Cairns every day of the year.